Overcome poor multi-material compatibility: Feature request "Interlock overlapping meshes"
Posted October 20, 2017 (edited) · Overcome poor multi-material compatibility: Feature request "Interlock overlapping meshes"
As we all know one major stumbling block for multi-material printing is material compatibility. If you look at the material combinations sheet provided by Ultimaker there are way too much "X". The reason for that? Due to their chemical composition those materials are not friends, they don't stick to each other, they don't print well on top of each other. For example, covering a simple tool handle, made of PLA with a skin of TPU won't work well as the skin might rotate freely on its own. Old school craftsmen know how to design strong joints without relying on bonding, like carpenters with dovetail structures. More generally spoken, they use topologically interlocking surfaces. But this "macro" scale interlock is challenging to adapt for arbitrary shaped componentens using 3D design software. At least, it requires profund scripting skills and information about the subsequent slicing process (layer height, line width, wall thickness) to produce something that slices well and achieves the desired goal. But 3D printing has the unique ability to do this on micro scale! I don't talk about blending / fusing two materials as this will likely suffer from the same limitations as mentioned above. No, it's about small scale topological interlock, typically within 4-8 times the line width or layer height. Cura already features a setting "Alternate Mesh Removal" which will make the printer alternate between overlapping meshes every layer. 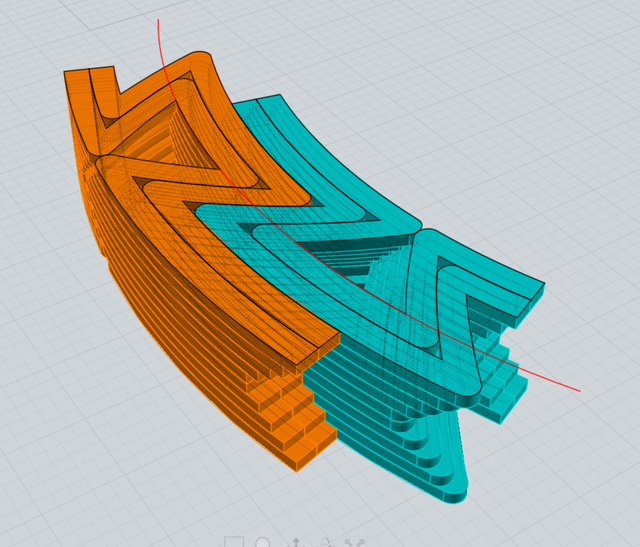 The good: Cura recognizes overlapping meshes. The bad: printing one layer of material A on top of one layer of material B will not produce a strong interlocking geometry and the printing itself will again suffer from the already mentioned incompabilities. So why not work on a feature "Interlock Overlapping Meshes" where Cura will connect/interlock both meshes using certain smart strategies. In other words: The designer overlaps component A and component B to some extent and the slicer will use this volume to interlock both parts. Simple interlocking in xy plane. The "micro dovetail". As a side effect, the contact surface between both materials is significantly increased, this should also support chemical bond. Possible interlocking in Z direction. An aligned 50% linear infill on areas where meshes overlap. Either material should print fine on top of and underneath this grid . So, @nallath what do the Cura devs think about this? And if it will never make it to the top 50 , any Cura contributors interested in this idea? Posted October 20, 2017 · Overcome poor multi-material compatibility: Feature request "Interlock overlapping meshes"
Beside those brilliant ideas I wounder how a horizontal interconnection could be achieved if there is no infill on at least one "side" (e.g. wall on surface). Well, if you want to attach a skin, say 0.8 mm thick, to a core you would have to include its two inner perimeter lines in the overlapping volume, which is completetly located inside the core. In a way that the outer two perimeter lines remain untouched and the inner two start "dovetailing" into the core part. Ofc interlocking two thin parts isn't possible. Posted October 21, 2017 (edited) · Overcome poor multi-material compatibility: Feature request "Interlock overlapping meshes"
I actually wanted to make a suggestion how to solve the problem for thin vertical interlocking structures but then I realised that there is one issue with the vertical interlocking anyway: How do you get to stick the very first line of the second material to stay where it has to (assuming it's not printed on the bed but on top of the other material)? edit: answer: you need e.g. 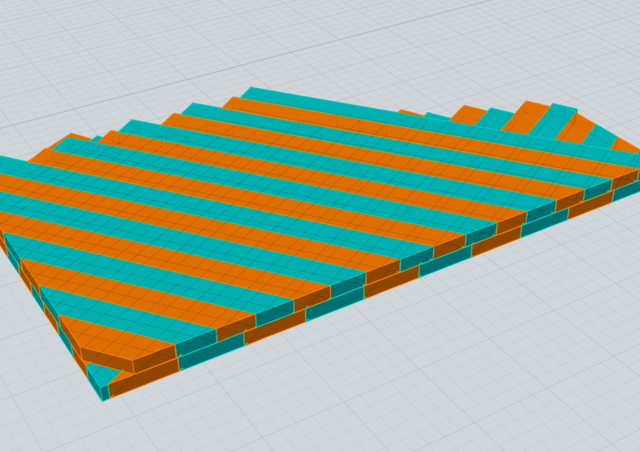 a horizontal expansion as it exists for the support in Cura. A similar issue rises if the horizontal interlocking takes place on top of an already printed surface and not the print bed. The structure there have to be small enough in order not to get warping/curling of the second material. Posted October 21, 2017 · Overcome poor multi-material compatibility: Feature request "Interlock overlapping meshes"
For the horizonzal interlock one could start with unmodifed perimeters of both parts and then incrementally protrude the dovetail until it's fully developed. For the vertical interlock. True, but at least not more of an issue as without using this technique I think. So how can we get the first layer of the new material to stay/stick where it should? The glass is one possibility (horizontal expansion). But in most case this is not practical. Posted October 23, 2017 (edited) · Overcome poor multi-material compatibility: Feature request "Interlock overlapping meshes"
This might be something that @bagel-orb is interested in. He's doing a PhD on slicing now. Posted October 23, 2017 · Overcome poor multi-material compatibility: Feature request "Interlock overlapping meshes"
@bagel-orb, curious about your opinion about that.